For the past couple of winters, I'd literally lived in my woolen sweater dresses, leather jacket, Hermes shawls and riding boots. In fact, I'd go as far as calling them my winter uniform. I love my sweater dresses so much that I'd practically stocked up a small supply from Uniqlo, Comptoir des Cotonniers, Ekyog and Zadig et Voltaire ever since I arrived in the UK. I've just sent off my Hermes riding boots to be resoled which I do so every year to prolong their lifespan. I was lucky to find them almost brand new at a secondhand store for 1/3 of its retail price. The thing is I'm a little bored with my so called uniform. I want to liven things up a notch. Be a bit more adventurous. Deviate a little from the my norm. This is quite an epiphany coming from a person who resists change, orders the same food items from Ocado every fortnight that I'm sure they can predict my grocery for the next decade and had to be consoled when my old Apple G4 finally died after a painful death because the new MacBook is soooooo much bigger (2 inches wider). I've decided to concentrate on what's lacking in my closet. Jumpers. I was inspired by a fellow blogger who wore a very simple jumper paired with skinny cargo pants with a colorful printed Hermes shawl wrapped around her neck. I dug around my drawer (note the singular to get an idea of the size of my closet) to find an alternative jumper. My +J Uniqlo sweater was worn practically every other day so much so it had a hole on the back. I finally managed to retrieve an impulse purchase from one of many Banana Republic sales - a £10 V neck pink jumper (!!). If you must know, I detest pink. Call it a moment of insanity, temporarily blindsided by the price tag. I love the both Rachel Bilson and Kate Bosworth's effortless chic style. Relaxed, casual, hip and cool. The way I've always wanted to be. I like their textured cable knits paired with shorts, skirts or skinny jeans which is perfect for early autumn when the weather is still fairly warmish but not cold enough to pull out my winter coats. I'm not in favor of thick mohair or alpaca sweaters prefering to stick to cotton or thin merino wool. I find them hard to layer particularly and boy, do they itch and pill. Ohhh - my fave! I love jumpers/sweaters and have told myself to STOP buying them because I have so many! I need to send you something from JCrew. Love their selection and prices. You can't imagine how thrilled I am that J Crew has decided that they do need customers from the UK. Feel free to send me ANYTHING from JCrew! I have 2 measly sweaters and I refuse to wear the pink one out. 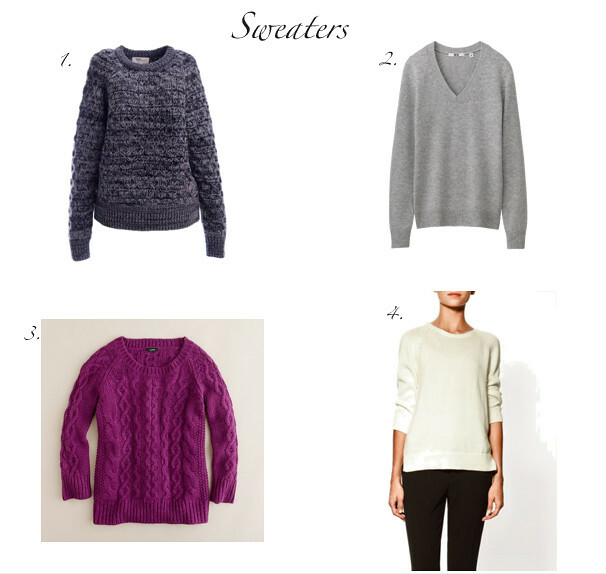 I love sweaters, but I always end up buying caridgans rather than pullover-style sweaters. Have you posted the Hermes boots before? I want to see them! Oooh! You can order from JCrew now? Yay!!! Like you, I tend to purchase cardigans but it's high time I start getting a few more pullovers. So do I, Lindsay! I'm really loving Isabel Marant's current collection. Must go to Zara for new sweaters! Cool choices, especially the pop of color from J Crew!